Issue 5 centers around Luthor’s first plan to create his own Superman, which turns out to be an imperfect version, a Bizarro Superman, if you will. Man of Steel #4 "Enemy Mine"
The story begins with Lois showing up at Clark’s apartment for their assignment to cover an event on Luthor’s yacht. Lois knows how to make an entrance. Byrne does a good job of providing us with some necessary exposition into both the new Superman, as well as the redone Luthor. We learn that Lois is still holding a grudge over the Superman story from issue 2 (which took place 18 months ago)and she despises Clark Kent with a passion. 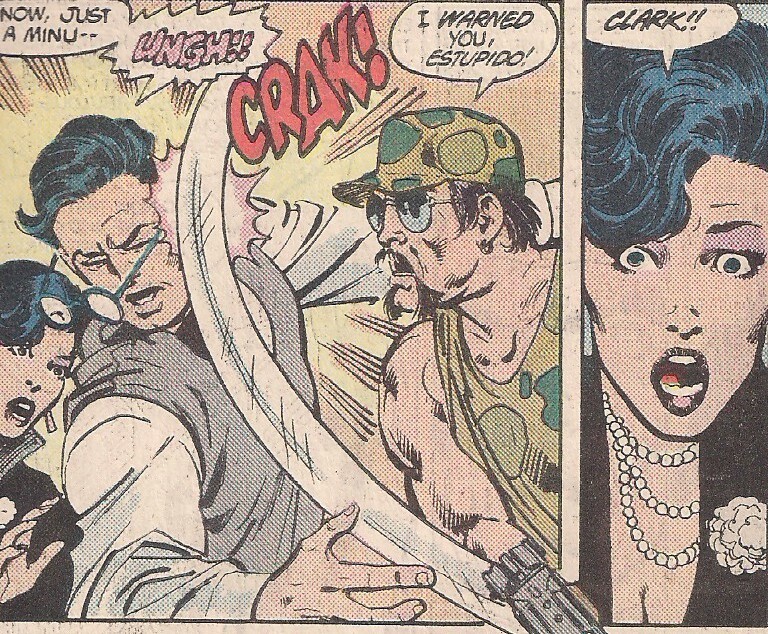 She insults him repeatedly in the 5 pages it takes to get them out of Clark’s apartment. She wonders how his parents end up with such a swine for a son and she mocks him for having a clean apartment. She wonders aloud how he can use such light weight and keep his size. I get the feeling Lois would have bullied me in high school. We also learn what lengths Clark goes to in order to maintain his secret with Lois in the house, the weights were an attempt to show how Clark can keep the physique of Superman and he keeps an electric razor to “shave,” when really he uses his heat vision in order to sear off his bulletproof whiskers. Finally, one of life's great mysteries is solved! I really enjoyed this scene as a kid because it was interesting to see the minutia required to maintain a secret identity when you’re Superman and have guests over. It’s not something that most writers in the past were willing to tackle but Byrne takes head on. We also learn about Luthor, for starters he sent a helicopter to pick up the two reporters because he has a thing for Lois. It’s sitting on Clark’s apartment building for upwards of a half an hour because anything Luthor flauts the laws in Metropolis. When we meet the big cheese, he tries to get something going with Lois and fails. These two are developing quite the Mulder and Scully vibe. Turns out the dress Lois thought was a loaner for the party was a gift and she immediately returns it, using Clark as a shield for Luthor’s eyes and then winds up using him as a shield this time from a gun! Turns out the ship has been boarded by generic Latin American terrorists. Clark gets pistol (pistola? )whipped and tossed in the river. He boards the ship, takes care of the invaders, is thanked by the mayor and offered a spot on Luthor’s payroll, which he of course declines, especially after Lex reveals he orchestrated the whole attack to see what Superman can do. Ever notice how Superman is always announced? Superman drops Lex at the nearest precinct,where Luthor is booked and is none-to-happy about it. To end our story he confronts Superman, swearing that he will destroy him! So much for being above the law! Absolutely, after issue 3’s weak entry, Byrne returns to form giving us a great issue that tells us most of what we need to know about the new characters. I wouldn’t be surprised if the Batman issue was forced from DC because it almost seems out of place. I loved the scene in Clark’s apartment and love this version of Luthor, especially in today’s environment. He reminds me of Donald Trump although I am not sure if Trump was a known commodity in 1986. He’s a ruthless businessman with bad red hair, who thinks he runs an entire city. It’s a shame that it looks like we won’t see this Lex in the new Batman v. Superman, instead it looks like we’re getting a hammy version of the Riddler. Man of Steel #5 "The Mirror Crack'd"
Issue 5 starts off with a bait and switch from Byrne, the opening page features Superman, talking to Luthor, holding a man that appears to be wearing Luthor’s pre-Crisis armor but is quickly revealed to be a henchmen hired by Lex and we’re in his office. Luthor claims that the man was fired from the company, stole the suit and didn’t realize the suit would kill him. Luthor notes how incredibly sad the situation is. Luthor then heads down to his lab, and we learn that he’s attempting to clone his own Superman but they’ve hit a snag, it appears that Superman’s biology isn’t human. When the chamber opens, the clone collapses. We then cut to Lois’ apartment, where we meet her sister Lucy, a flight attendant that’s been blinded during a hijacking. Lucy puts on a brave face for Lois, but she’s not coping well. Meanwhile, "Superman" flies an ambulance over traffic to a hospital, but something is off. The EMT runs from the monster. Lucy decides she can’t cope with being blind any longer and jumps from Lois’ apartment but is rescued by the clone Superman but she can’t tell the difference. It's like looking in the mirror, if the mirror crack'd! The clone then steals a suit and a par of glasses.Then he shows up for work at the Daily Planet. He’s confronted by the real Superman and promptly wallops him into next week! Once Superman gets his bearings he promptly burns off the suit, leaving a Superman costume, because we can't have people seeing a dusty clone Superman dressed up as Clark, it may put ideas in people’s heads. Lois, ever the reporter, starts asking Superman questions mid-battle and gets kidnapped by Bizzaro. Bizzaro plants a nice kiss on Lois, and flies her back to her apartment. Lucy is starting to see colors and shapes again now that “Superman” is around. The real Superman arrives and the battle continues, he uses his microscopic vision to learn that the the new Superman is not organic, so he can take him on full blast. They collide full blast and the dusty Bizzaro is turned to dust. The debris clears up Lucy’s vision. Lazer Tag the cartoon show? That may be the most 80s thing ever! Yes, this is the first story of the series where we see Superman dealing with someone on his level, and get to see him go all out. We also get to see what Superman would look like, with his powers but without the intellect. He still of wants to do right, by saving Lucy from jumping and helping the ambulance, but ulitmately he must be stopped. The monster is also noble, somehow knowing that he must be destroyed and that his makeup can help Lucy. We wrap up the Man of Steel, with issue 6! Superman returns to Smallville and learns his true origin!